Dinosaur Makeover: Can Research Triangle Park Pull Itself Out of the 1950s? It’s a strange moment for the architecture of technology. In Silicon Valley, a place that likes to think of itself as America’s epicenter of innovation, three tech icons—Facebook, Apple, and Google—are doubling down on suburbanism. The firms are all busily planning expansions into single-use corporate playgrounds. Sure, they’re full of free massages and micro-kitchens, but they’re utterly cut off from the communities around them. Meanwhile, on the other side of the country, in North Carolina’s research triangle, America’s quintessential exurban office park is trying to execute a 180 in the opposite direction. 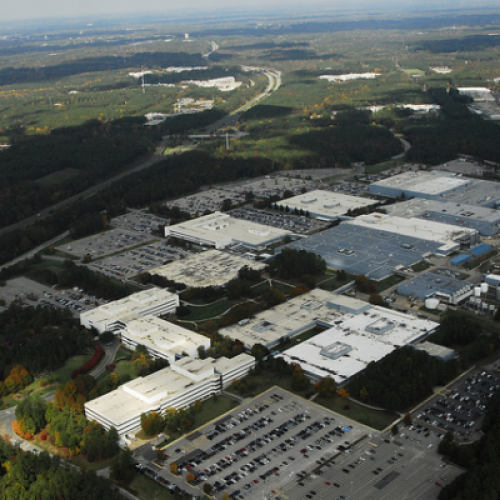 A half century ago, Research Triangle Park was considered the cutting edge modern workplace. As Tarheel State agriculture faded, and bright young people fled northward, the Durham area’s universities had pulled together with corporate pooh-bahs to stage an intervention. They cobbled together 4,400 acres, furnished it with basic infrastructure, set up a private research institute, and threw it open for business. Within five years, IBM had built a 600,000 square foot facility there; the federal government committed $70 million for a health sciences center. Over the next four decades, the park would grow to 7,000 acres, 22.5 million square feet of space, 170 companies, and around 40,000 workers. And North Carolina reaped the benefits: While many of its neighbors reel with every recession, the Raleigh-Durham region is now an oasis of relative prosperity, attracting high-caliber college graduates and pumping out lucrative patents and trademarks. But over the last decade, the park’s shine began to wear off. The working population, which had grown steadily through the 1980s and 1990s, flattened out. One big telecommunications company went bankrupt. IBM sold its computer business to a Chinese company that moved jobs away. Underlying the trouble was a significant change in how corporate research and development works: Companies don’t make the same kinds of long-term investments that they used to, preferring instead to lease space as needed for big projects. These days, places like Austin and Seattle seem like pretty attractive places to do that, for reasons beyond just the economics of office leases. The current generation of tech workers doesn’t want to toil in the soulless Office Space complexes surrounded by moats of parking that dot Research Triangle Park’s sprawling vastness. According to a source with knowledge of the redevelopment process, attendance rates at the Park’s companies had declined significantly in recent years, as more and more employees decided to telecommute and skip coming into the office at all. What kind of experience is that? One where you can walk or bike to the office, get a great cup of coffee during the day and a decent beer after work, hang out in a park across from your house and shop nearby. The kind of environment that’s attracting startups to New York City, San Francisco, and Washington D.C. (and pushing real estate values up at the same time). “Whether you feel comfortable or agree with that approach to life, it’s how they make decisions today,” Geolas says. So Research Triangle Park needed another intervention. A couple years ago, the foundation hired consultants from New York City to put together a new master plan that would insert housing and retail clusters between the office complexes. To make it possible for people to live in the park, they had to change the law so that new residents would pay normal taxes, and fix a zoning ordinance that had codified the low-density layout. Now, they’ve got a developer signed up for the construction, and are planning a public rollout of the plan in early November, complete with a state-wide promotional bus tour. The vision, alas, remains fuzzy. While name-checking big cities where college grads work and live in the same neighborhoods, Geolas hesitates to even speculate about how many housing units the park will eventually have, or how much it will cost to build out; they still need to do a market study that’ll determine who actually would want to live there and what they want. He also plans to convene an international panel of architects and designers who’ll sketch out an aesthetic for the new neighborhoods so that it “doesn’t look like just another mixed-use development” like you might find in other new urbanist enclaves—something modern, he figures, in line with the park’s techy raison d’etre. Geolas had retained the firm that consulted on Manhattan’s High Line, and wants to infuse a little of that 21st-century magic into what’s now thoroughly stuck in the past. Geolas may not be able to make Research Triangle Park into the next Meatpacking District—it’ll never have the kind of exposed-brick post-industrial loft spaces that are now sought after by new businesses and the entrepreneurs who run them. But if he does it right, it’ll be much more affordable than New York City, and just urbane enough to make the difference for the kind of people who might found the next Apple or Facebook. Meanwhile, back in Silicon Valley, those companies’ future employees will be paying twice as much to sit in traffic that just gets worse year after year, wondering if they shouldn’t have moved to North Carolina instead.